Soft, creamy eye liner pencil glides on easily over the eye lid to define and highlight your eyes. The long staying formula lasts all day, yet is gentle and safe for people with sensitive eyes. Price: Rs. 249 for 1.15 g purchased from UT. Another color from my favorite eye pencil. Its texture is super soft, creamy and smooth. It glides so easily on lids without any extra effort. In the swatch, on my hand, I have swiped the pencil only once and see the color is so opaque. I now you’ll get better idea on eyes. It is perfect for everyday use as it is smear free, smudge free. 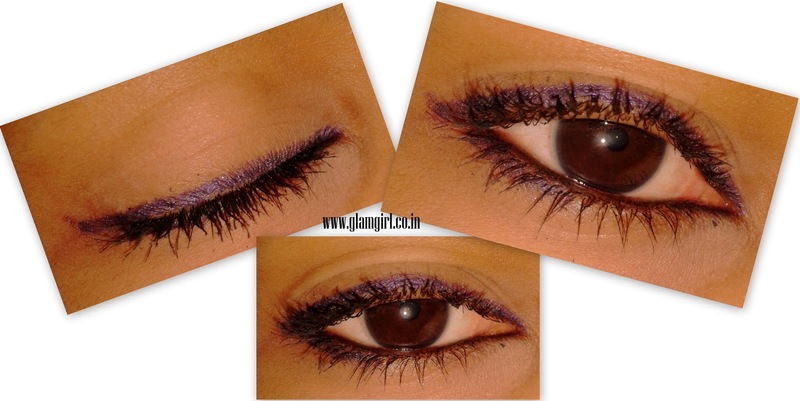 I think those who still hesitate to try other eyeliner colors except black and brown, must try this, you will love it. It is also available in navy blue, turquoise blue, solid black, solid brown, forest green, aqua blue, dark green, gray, metal brown, etc. I am not sure if I have missed anyone. Though is soft but he point doesn’t break easily. Extremely soft tip breaks while sharpening. I recommend it: to everyone. The color awesome can be used alone.